Hi, I have been working on something similar. I need mine to be ten times bigger. That would be ten 4×8 sheets of insulation covered with aluminized mylar to heat my 4,000 sq ft house by 10 degrees to last through the night. Each 2 kW reflector like this costs $25 for the mylar and insulation board. There is probably not a more efficient $/Wh solar system. You can strengthen the insulation boards to withstand maybe 80 mph winds using duct tape followed by 2 layers of 3M packing tape that covers 1/3 the 4×8 surface. This way, the boards completely and reversibly bend in strong winds so that your support structure only has to withstand winds on a much smaller wind-exposed area. Maybe 1/3 as much area. Otherwise, large flat arrays like this would require serious plywood and steel structures because of wind. I plan on my final design to be taken down and stored in less than 5 minutes, all ten 4x8s. The insulation boards weigh 4 pounds. So I would like to have 20 kW system and it should cost less than $1000 with support structures and tracking. $0.05/W is not bad. Since it will have tracking, that’s about $0.03/Wp. Compare that to Nanosolar and First Solar at $1/Wp. Like Rob, I estimated about 2kW per 4×8 and about 80% efficiency. The mirror glass surface reflects 4%, but it will be directly towards his target, so it’s not wasted. But then the light hits the actual mirror which loses maybe 5% and then it hits the air-to-glass interface again which will lose 4% so I come to about the same 10% loss for the mirror like Rob said. His comments on double pane are correct, except for maybe 1% better because of back-reflections. Also, a commenter stated at certain angles reflections is more. True, but only if you get close to 30 degrees angle of incidence. After that it gets bad very quickly. Here is my excel spreadsheet that is very accurate on sun intensity, and knows sun position within 1 degree for all locations, at all times, including leap years. 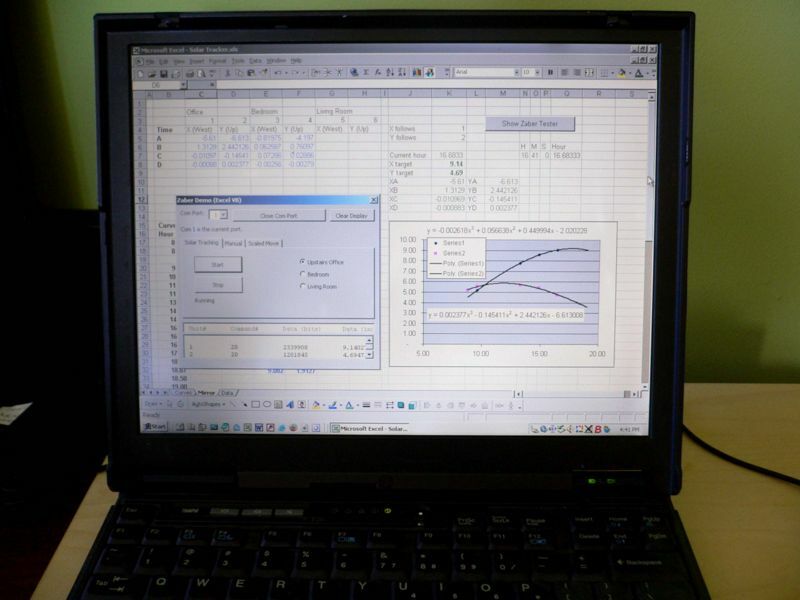 Go to “tools” “macro” “visual basic editor” to see the equations. I have not yet modified it to be directly useful for heliostats. It helps to know the angle between an arrow pointing towards your target and an arrow pointing towards sun is = arccos(cos(sun_altitude – target_altitude)*cos(sun_azimuth – target_azimuth)). The direction your mirror is pointing is an arrow that is perpindicular to the surface and is half way between the target and the sun. Using this info, you can modify the equations. PS, a problem with heating your whole house is that you have to concentrate the mirrors on a window. I have used my three 4×8 sheets on a 6×6 window for about 6 days with great results. It is not completely safe. Under some circumstances, it might be able to cause a fire. The mylar has wrinkles that causes hot and cold spots in addition to being about 2.5 times the strength of the sun. 2 times the sun is very safe if you have perfect mirrors because there are mirrors all over the world accidentally causing 2x the sun’s intensity on all sorts of random surfaces (the sun plus the mirror’s reflection). I have tested up to 5 times the sun (actually 5*0.80 = 4 times) with the mylar for 2 days and it’s really serious business. The are solutions. I need 5 times the sun through two 6×6 bay windows to completely get off our gas heater for 24 hours on cold sunny days. This will get the house up to 78 F and down to about 68 F the need morning when the sun comes back. Only 3 times the sun (actually 3*0.80=2.4 times) in each bay window might be enough. Certainly only 3 boards decreased our heating bill by at least 30%. The reflectors need to be as close the window as possible so that less concentration occurs inside the house. This also means less adjusting is necessary if you’re ddoing it manually like i am in my tests. At anly 9 feet away, 3 adjustments per day are all i need with these boards because they are a little bit too long and too narrow. Any light coming into the house will age anything it hits. 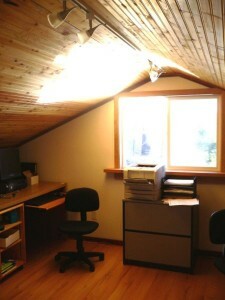 You can set up a black tile-on-plywood light-blocker inside the window to receive the heat and protect the inside. Some people complain about the heat reflecting back out the window, that represents a fairly small amount of surface area if the light makes it far enough into the house before hitting something off-white. The focal point will be the window, so any exposed material around the outside window needs to be white to prevent aging or possibly even a fire. An alternative is a black-box air heater set up outide the house with ductwork and a fan. My tests indicate these can easily be made at least 70% efficient without having to reset to the aluminum can method….just use a black-painted sheet of aluminum. I used silvered mylar for my prototype but found it too difficult to get a flat enough surface. My heliostat was originally about 50ft from the house (to get out of its winter shadow) so it needed it to be quite flat to reflect light on target with any accuracy. Yours is much closer to your house so you can get away with it. Nice idea using foam insulation panels. I’ve been considering trying that out on my heliostat. If only I could figure out a way to get silvered mylar to lie pefectly flat, or find some other lighter mirror material than the glass ones I’m using now. I’m curious how you plan to add automatic tracking. I noticed in your picture you have 3 panels mounted on a large vertical stand. 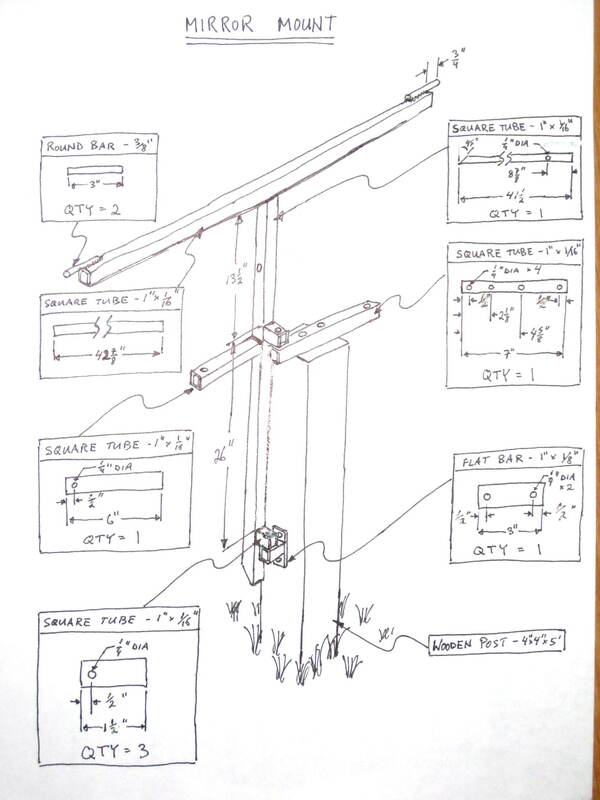 Is your plan to rotate the entire stand about the vertical axis and adjust the tilt of each mirror independently, or to somehow create linkages to synchronize the tilt of the panels so you can implement tracking of the entire setup (3 panels) with only two motors? PS. Even with my relatively flat mirrors I get hot spots and on one occasion blistered the stain on my bed frame. I’d be reluctant to aim more than two mirrors at any one window (except perhaps for temporary demonstrations for friends… “just go stand here or a minute” ;-)). If you were closer to your window, 3 mirrors would be safe. I believe one of your mirrors was not perfectly flat and at that distance, a very slight bend meant a strong amplification. Also, you’ve got a lot of possible overlap in vetical dimension so you could have had more than 2 on the same spot. I would estimate that it would take at least 4 times the sun’s strength, through the double pane, to blister a stain. For example, set the same stained wood in the sun, then use 2 mirrors to triple the sun’s intensity and i bet it would not do it. Nevertheless, aging furniture and carpet will cost more than the energy savings. I once used a $5 walmart “full length” mirror, about 1×4 feet, and smoked the stain on a dining room chair. Left alone, there would have been a fire. I do not plan on using the stand as a permanent solution. It’s for playing and testing. It was fairly easy to build and weighs only 11 pounds and can be disassembled. Here’s a pic. I have 4 dumbells at each corner to hold it down in the wind, so it’s a lot of trouble to adjust those 3 times per day. I once forgot the front dumbells and it flipped over backwards off the deck. It broke one of the 1×2 legs but otherwise no harm done. The mylar is supposed to reflect 95%. I don’t know how many winters it can last, but it can pay for itself in 1 winter, here at atlanta latitude. I spend $1,000 a year on natural gas heating and that’s not even keeping it at 72 F. R-50 in attic and about 2/3 are R2 windows. My goal is $200/year heating (cloudy days) and averaging 72 F.
You can use concentrators or hot-air boxes to do air conditioning, but i have not seen any DIY systems. What you have to do is use the heat to dry out desiccant that is in a slowly rotating wheel. As it dries, it rotates into your house airstream to dry out the house air. This heats the air up a little, so you need to then send it through a heat exchanger and then send it through a swamp cooler that adds water back to the air and cools it off 15 F. Theoretically it can even be used for freezing. The problem is that the heat exchanger and desiccant wheel add complexity and the desiccant wheel may not be easy to build or it might be expensive to buy. You need on the order of 100 pounds of desiccant in the wheel. The COP factor is about 0.9 under best conditions. Theoretically it’s like a heat pump, but practically COP <1. I had to post as 3 messages because the system kept saying I was spamming. Yes… there is overlap of the light reflected from adjacent mirrors in my heliostat design. I wouldn’t be surprised at all if there was a 5x concentration when the stain on the bed frame blistered. But it’s exactly because I haven’t figured out a reliable way to prevent those types of concentrations that I would be reluctant to add more panels reflecting into the same window. It’s difficult for me simply to move the heliostat closer to the house since it’s a two story house with the north facing windows on the bottom floor (ie I need some distance to get out of the shadow from the 2nd story). The plywood sheet on which the mirrors are mounted is not perfectly flat and produces unpredictable focal lengths. I may try a welded metal frame to avoid this. Then I would be more comfortable adding more heliostats. Looks like you have a great project. Please keep us updated. thanx for working on harvesting the sun. I took the C-Code from Dimitri and changed it a bit so that the algorithm will compile with the ‘primitive’ Compilers for Microprocessors like Atmega16 (AVR-Compiler). This C-Code has some output-source. If you want to use it for Atmega or so, simply remove the stdio.h-include and the printf’s in the main-function. the freon thing spider talked about was an invention of a company called zomeworks, headed by steve baer . they did some really nice inventions and are still around. the free program for sun tracking is one of the best things i have seen in many years, perfect! all i can hope for is to see the day that there is a version for dummies like me. hope you will put the program and its devopments in many places so that more people can work on it . looks like you are initiating the solar linux………..btw guess you all know the box by practical solar? For the same amount of time, I have been working on a heliostat of my own and finally have it up and running. The hardest part was figuring out how to program it. I’ve noticed that a lot of people seem to be stuck at this spot also, so I decided that I would contribute my time in order to write a program that would make it easier for them. 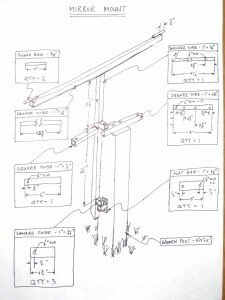 This program will do all the calculations necessary for up to two heliostats and will also send signals through the computer’s parallel port for controlling the stepper motors that will adjust them to the correct orientation. In addition to that, you can hook up limit switches to your machine and the program will automatically seek them out and reset its position at the press of a button. It’s been working well for me, but it is still just a beta program, so be careful. I think I’m about finished working on it though because I can’t really think of anything else to add. At this point, I mostly just need people to test it out and confirm that it works on computers other than my own. For example, I don’t think it will work on a 64bit Windows OS. If someone needs it, I might be able to fix it, but I don’t have one of my own to test it out on and need someone who does. Your program is the most comprehensive I have seen. Thanks for contributing it. One consideration is that depending on the drive mechanics, there may not be a simple constant gear ratio between the stepper motor position and the heliostat angle. In my design, for example, the stepper motor rotation is converted to linear motion via a leadscrew which pushes on a lever arm to rotate the heliostat. The stepper motor position is related to the heliostat angle by a sine function rather than just a constant. Designing a program to meet the demands of ANY drive geometry without allowing modification of the source code is a challenge. Oh Yeah. You’re right! I didn’t think to mentioned it, but this program wouldn’t work for your particular heliostat design without modification. I need to bring that up somewhere in the program’s documentation (Which still needs some work anyway). Thanks! I’ve been making my own worm gears out of threaded rod and plastic, so a simple gear ratio would work in my case. My heliostat is based around a gimbal design, so the mirror is pretty well balanced, which is why I can get away with using cheap homemade worm gears. I will have to look into the lever arm design sometime to see if I can include it in the program somehow. I’m sure that it can move a much heavier load than my worm gears. Oh, and if someone did want the source code, I can put it up on my site for download. It’s something that I was planning to do eventually anyway. I just need to add some comments in the code and probably clean some things up. Maybe mylar film glued to the front of a piece of plate glass would work? Certainly two trips through the glass of a normal mirror can’t be helping efficiency. I have found Hardibacker to be a fairly stiff, strong, flat, rot proof material. I think two trips through the glass of the mirror makes little difference to efficiency. I believe you get about 4% reflection at any glass/air interface, but as long as the front surface of the glass is parallel to the back mirrored surface, both surfaces will reflect the light in the same direction, so it doesn’t matter. I’ve tried gluing silvered mylar to different surfaces in an attempt to make a panel that is lighter and cheaper than using glass mirrors. The issue with that is thermal expansion. Just about anything it might be useful to glue the mylar to will have a different coefficient of thermal expansion and as the temperature outside changes, the mylar will wrinkle scattering the light. An option I’m considering is using mylar bands about 1ft wide stretched across a metal frame with a tensioner (bungy cord) to take up the slack as the mylar expands and contracts. That could reduce the weight a lot, but I’m not sure how it would react in the breeze. It may resonate, scattering the reflected light. Hard to find good data, but I think cheap glass with iron in it actually absorbs about 5% per pass. But I agree, not a big factor. I wonder if mylar stretched across a flat surface would work? If there is nothing behind the mylar, I would expect the wind to change the shape (ie, depress the center). My small heliostat is coming along – uses a glass mirror, vertical pipe, threaded rods, geared DC motors, a hinge, hardibacker. I should also mention that I have purchased foam insulation boards that already have a reflective film attached. One was white beadboard and was very shiny, the other was a stronger, stiffer foam but not as shiny. Never tried them in the sun, but never saw the surface wrinkle either. Looks like aluminum foil would be a better fit than mylar in terms of temperature expansion. I’ll try some on Hardibacker (using spray adhesive). I will try one for a friend. I will use a programmed clock and add motor motion depending on time and month. Kool website!!! The best way to position a heliostat is a good question, especially with DC motors where you aren’t sure how far it moved. I’m leaning towards a low cost webcam to see where on the wall the sun is directed. A webcam with custom software to track the position of the reflected spot is a workable idea for a single heliostat which I think is your plan, but controlling multiple heliostats to reflect sunlight onto a single target would be more difficult. 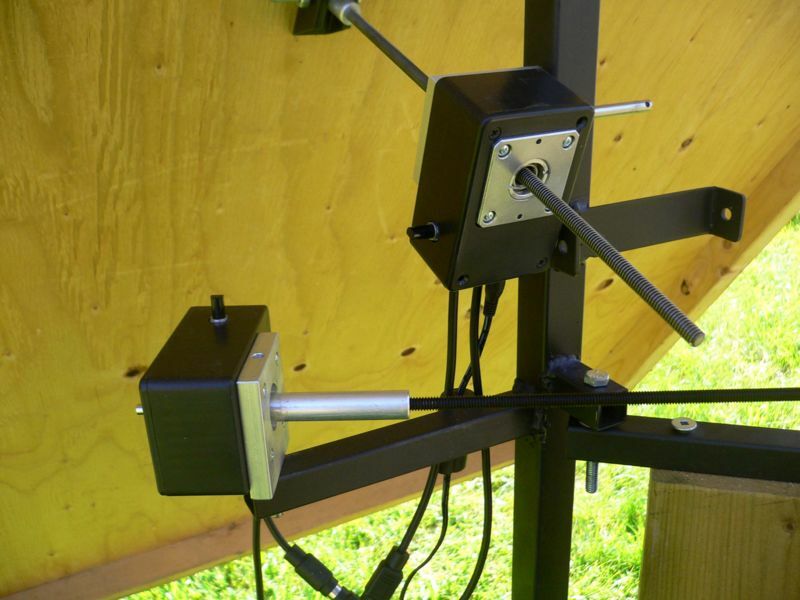 In that case an open-loop positioning system of reasonable accuracy is required, though a camera can still be used for periodic calibration of the open-loop system (ie one heliostat at a time is moved to reflect light onto a calibration target). 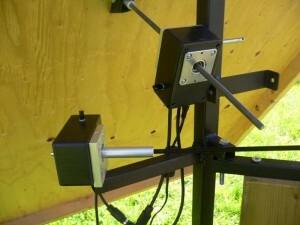 This is the method used by some friends of mine working on an engineering/art project called The Heliomatrix http://www.heliomatrix.org which consists of an array of independently controlled mirrors that can be programmed to paint a surface with sunlight (like a laser light show… only bigger and slower). On thing I have discovered is that if the heliostat is close to the house, the system is not very sensitive to position. 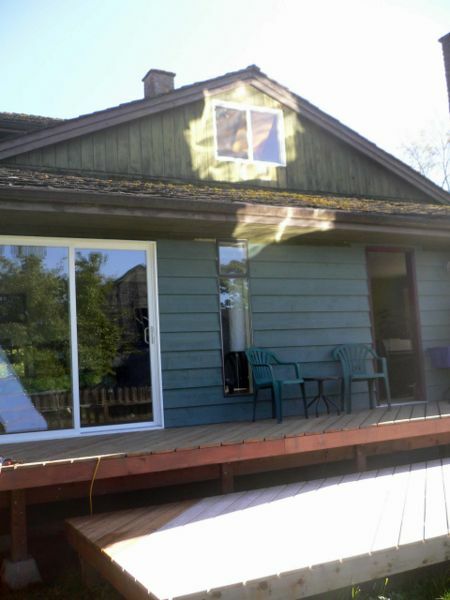 Ie, my 1’x4′ mirror is on a deck, 12′ from the house, facing large windows. I’m not picky about where it hits inside the house. +/ – 15 degrees is ok. So some simple system without feedback or sun position might be fine, even with DC motors. I expect to use some solid state relays to control four 12VDC/500ma power supplies. The lowest cost control I have found is to use an Arduino with the Adafruit motor shield. It has H bridges, so needs only one power supply to get forward and reverse for two motors. Motors were from http://www.surpluscenter.com. Rob, I hope I’m not misusing your forum for discussing other systems. My system is great for putting a very bright rectangle on the wall, but I would prefer something a little more diffused. Something like a pebbled mirror, although I can’t think of where one would get that. I used the spa.c program to get an accurate sun position plus a little trigonometry and it works well with an arduino, adafruit motor shield and DC motors. 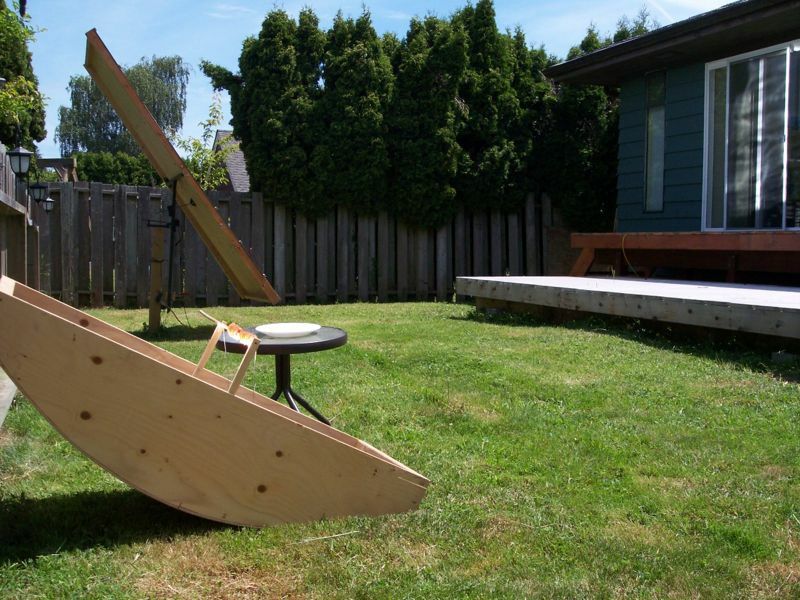 Hey Rob cool idea, currently I’m trying to make a Heliostat that is stand alone…..I have looked at the basic program but would still like to see the formula’s so I can convert easier. Im impressed with your heliostat, it seems one of clearest and most straight forward designs on the net. With high winds would it survive? Wind loading would obviousely be large as it is a pretty big sail. since the stepper motors are part of the supporting ‘stays’ via the threaded rods, are they able to withstand the pushing/pulling force – i havnt used stepper motors before and wondered whether they are designed to handle that force. I have installed a few Satellite dishes over the years and the wind loading figures for a 1m (40inch) diameter dish are pretty high. Balancing the pivot point to reduce motor thrust requirements has the side benefit that a constant pressure applied over the mirrored surface results in very little force on the leadscrews. Most of the force is transmitted to the frame rather than the leadscrews. Also, the design pictured uses a single sheet of plywood as backing which results in quite a nice sail, but I have since switched to a metal frame with a 1/4″ gap between each mirror which I find reduces the wind load considerably compared to a continuous surface. If the linkages are built well with no backlash, wind loads are tolerable. If there is any backlash in the system, then the wind load is amplified by inertia and will do more damage at lower wind speeds. My metal frame design has survived continuous operation for the past 2 years with gusts up to 50km/h. The only adverse effect has been loss of position reference (wind loads are enough to stall the motors, but not to damage them). The motors run for a fraction of a second every 10 seconds. If that happens to correspond with a high wind load, then the motors will stall and a small amount of expected motion will be lost. Over a long windy period that can result in the heliostat lagging behind it’s target position. In that case, it’s relatively simple to make a manual adjustment and push a calibrate button in the software to accept the current position as the correct one. Still, don’t expect satellite dish robustness from this design. It is a relatively cheap design built by someone (me) who was willing and able to tinker with it on an ongoing basis to keep it operational. Building for a consumer market is a different thing altogether. Err Um “ok, I think weve got a business here” lets form a company, chip in .. and go with what works so far..
ie; standardized 8mm toughened Glass mirrors, no frames, corners rounded and sanded safe for kids, bonded directly to a Plazma Screen type motorised tracking brackets, independently powered from its on board PhotoVoltaic cells, wirelessly N networked and GPS position aware, totally controlled via the Home PC software. its so easy to visualize. Sell em at Wal-mart, simply dig six or eight postholes in the yard, concrete in the posts, plonk the hi status Branded units on top, and aim 2 or three at each window, load up the software, and thats it, it works! The air conditioner moves the heat around inside to balance room temperature and when you come home from work around 6:30 pm, the house is cozey and warm enough to coasts into the next sunny day. No more heating bills! And with PhotoVoltaic Solar Cell Trackers added to the system later on, no electricity bills either! Yeah! Ok, whos in, and whos is top class a International Patent and Trademark expert?? Regarding Nrel Spa.algorithm Could use assistance with my slight understanding of C,finally have the program outputting azmith and zenith. need advice on how to change the output to a ratio in C, for driving a stepper motor,for instance azimuth is now 271.525644 how would I multiply by 860?,For any advice please note,have been using Linux, ubuntu mostly, for the past few years do not have any windows available. Thanks. Off subject comment: For several years ,have been using,receiver axis mounted electro mechanically controlled, twenty five, one square foot mirror tiles focused on high mount bathroom window, within the bathroom past the focal point have convexly mounted mylar reflecting and spreading heat to concrete bathroom floor. That bathroom is now a most pleasant room even being situated on the north side of the house. Very cool idea. I’ve been collecting parts the past year of so to someday do this… in the mean time I’ve been playing with the concept and using the mirrors around the house to either bounce in more light from within the house or simply up my lumens by reflecting light bulb on textbooks I’m reading using a desk size make up mirror. Sounds hokey, but all this adds up to learning more about what I can do with the resources I have at hand. It does make a difference. 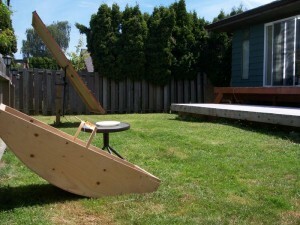 powered mount and wonder if your heliostat would do away daily adjustment to efectivly track the sun. Ilook forward to hearing from you with your thoughts. I like this idea of heating rooms and also providing some indoor light. 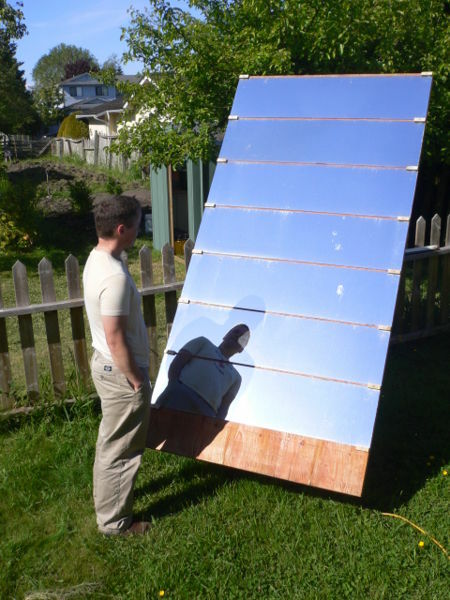 i have tried a similar “heliostat” made with cardboard ‘ covered with Reynolds heavy duty aluminum foil which I keep in the balcony to reflect solar heat into my bedroom. I live in Bangalore [13 deg parallel] which gets cold in winter months.It is effective.Thanks for your design and promoting this soalr energy applicataion. For a heliostat to work on its own without the computer. Could you put two photo censors on it X Y then manul calibrate (aim it at target) then let the photo cells run it. I do like your design looks good. 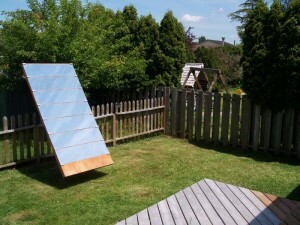 i am new to this and planing to build solar furnace. It is more difficult to do that than you might think. Using photo cells, it’s relatively easy to get something to point directly at the sun but it is not so easy to get something to reflect sunlight onto a target. That is because the mirrors don’t need to point toward the sun or toward the target. The mirrors need to point to a virtual location in space that bisects the angle between the sun and the target. It can be done but it is mechanically and electronically complicated. Using a computer or microprocessor with suitable software or firmware, programmed with the current latitude, longitude, time, and target vector is quite a bit simpler. I just stumbled into this web site. I use 3 plastic K mart mirrors mounted on a fence to direct the sun to the entire back of my house during the winter. neighbors thought I was crazy at first but for the past three years but it does make a big difference. the sun hits the two rear windows ans the entire outside wall. I know the back of the house is warmer as a result, and I I have direct sunlight against the front of the house all day. the heat does not come on for the better part of the day and it is warm. Rob; in your post 2011-02-18 at 10:33 pm you mentioned it was easy to get something to point direcly at the sun. Could you explain how that can be done simply? Also, what are your thought about doing the simple and using a Frensel lens to collect the energy? I only meant that it’s “comparatively easy” to get something to point directly at the sun. Depending on your electronics experience it can still be difficult. Here’s an example of the easiest way I know to do it without a computer: http://www.youtube.com/watch?v=j_yqBdbuKpg. For each of your two axes of motion (azimuth and elevation control) you need two detectors aimed 90 degrees apart from each other (4 detectors in total). The example above just shows one axis. Each pair of detectors is wired in parallel but with reverse polarity to make what’s called a split detector. A split detector will output positive or negative current depending which of its two detectors is receiving the most light. You can use that positive or negative current to drive a motor that will turn your device until both detectors are receiving exactly the same amount of light, which will be when the line bisecting the two detectors points directly towards the sun. The example above uses PV cells for detectors. Those may output enough power to run a motor directly. If you want to use smaller detectors like photodiodes, you will need an amplifier circuit to drive the motor. See. Easy peasy! Using a fresnel lens is a simple solution if your goal is to heat up a small object (ex a cooking pot or frying pan) to a high temperature. But if your goal is to move the energy somewhere else (ex to heat a home) I think you’ll find a fresnel lens is no simpler than other methods. 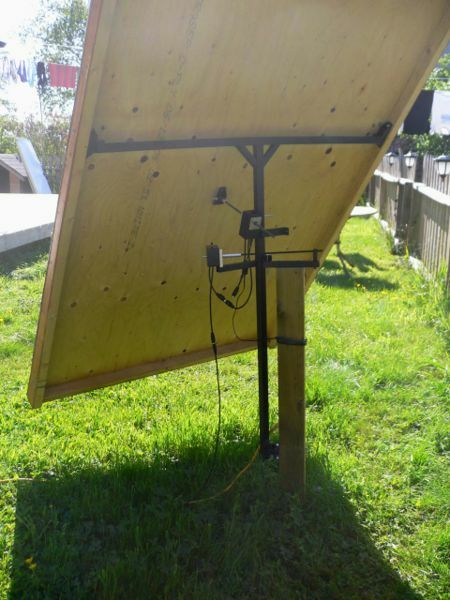 I am looking to create a Heliostat, I am looking to do it without circuitry, I have just finished my solar tracker and will try and use the principles I learned making it to make a helistat. the tracker has no circuitry it basically relies on a difference of power to track the sun. 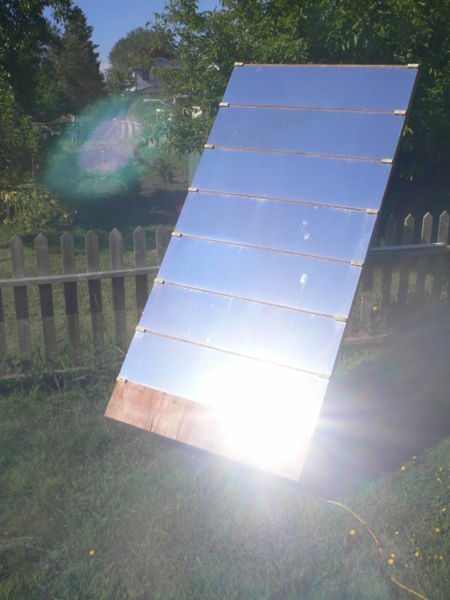 Has anyone attempted to make a heliostat without using computers circuitry or anything other than a sun tracker as guidance for moving the mirror? After a lot of vector math, I finally found out how to do real single-axis tracking based on turning the mirror 15 degrees per hour instead of electronics or optical tracking. You simply point the axis of rotation half way between the celestial south pole and the target. Amazingly, it all works out. You use another axis on top of the perpendicular axis to adjust the mirror depending on the season as the sun’s position changes. In the diagram below, the radius of the inner circle is determined by this second axis. hey most of my windows in my house are facing south where there is a 3 storied house! due to this my home hardly receives any sunlight in the south direction!…can i incorporate the above design by mounting the heliostat to my neighbour’s wall?…can u help me with ur suggestions? i will also post the necessary photos if u ask for it!!!! Good to see you back. Thanks for the links. If sunlight hits your neighbour’s wall then yes, in theory you could mount a heliostat to it to reflect the light into your house. In practice it may not be easy. Sorry, I don’t think there’s much I can do to help. Thanks a lot for sharing this article , it is very usefull. it is describing a heliostast solar generation project on a large scale ~ Mega Watts for a company called esolar. they said the project cost was more than 110 million $ !!! why did the project costed all this ? also what is the difference between the technology they are using and the technology used here by all of you guys to make a heliostast at home. Nice video. I can’t comment on the cost. The only real difference in the technology is they are heating water to generate steam to turn a turbine to produce electricity. That’s what you need to do to distribute power from a single location. But for the backyard tinkerer it is much more cost effective (and more efficient) to put the heat straight into your home in the form of reflected radiation, especially if you have well placed windows already. Inspiring stuff! You might find LightManufacturing’s Heliostat (the H1) interesting – see http://www.lightmanufacturingsystems.com/heliostats We’re using a tensioned membrane mirror for light weight and other advantages. Our aim is to apply solar thermal / heliostat energy directly to manufacturing processes, with the aim of lowering costs and reducing greenhouse gass emissions. I finally am getting close to getting really good designs for my heliostats. I would have failed if I had not seen the way you used screws to turns the axii. Axii? Axis? Anyway it’s only $20 worth of PVC and $2 for the 3 foot 1/4″ screw rod from Lowes, and $12 for each DC motor. My instructable ( http://www.instructables.com/id/Heliostat-for-heating/ ) will be finished in a couple of weeks showing details. My next design will be a small one from 1/4″ copper tubing for fun, or maybe to shine on a prism hanging inside a window. I am placing LED’s as sensors on each side of the 4 sides of the windows to control the motor. Only 8 other electronic parts to control 2 axii in both directions using an AC motor….an amazingly efficient circuit from redrok.com. i wanted to generate electricity from this project how can i do so? was glad to see zawi’s post about having done the math to confirm that an axis oriented halfway between the latitude angle and the polar(“equatorial”) axis works. didn’t want to learn spherical trig, so I was going back to designing a linkage bisecting the sun-to-target angle. it actually seems that it would have been better than to lose 10 percent to a second mirror: a device like a three-legged version of a drawing compass with a slider on the middle leg connected to fixed gimbals on the outer two. actually, the target-pointer would be a fixed gimbal, and the sun-pointing gimbal would be mounted on an arc, concentric with the main pivot, for seasonal adjustment. the center leg of course would be fixed perpendicular to the mirror, with the main pivot in the center of the mirror frame, in one of the wind-pressure-relief gaps. hope this is reasonably clear. thanks to zawi the design will be even simpler; a single-axis with manual adjustment of seasonal tilt to sweep out the correct cone. might even make the mirror two-sided, and let the clockwork run at night to save manual resetting. This site is so inspiring. I think I’ve seen it in the past but a lot has been added in the last few years. I’ve experimented with solar heating via mirrors. I work cheap and so went with 1′ x 4′ mirrors designed for interior use. My learning curve has had many parallels to ‘zawy’s’ work. I too have learned by humbling experience that 2x solar concentration is about all that can be allowed reflecting through a window. I use vinyl “L” extrusion on the edges to keep the mirror from going concave. I watched the video showing the hinged insulation boards covered with Mylar. You’ve indicated the problem with the concentration was solved by making the boards convex. I’m a little worried about the 200F temperature on the furniture and the carbon black interior target. With my mirrors I haven’t recorded any temps like that but I do have one sensitive area next to our deck through a glass French door. In that location, I have to be careful of several furniture items. I’ve had one incident but with no real damage. Anyway, I installed a diffusing grate interior of the glass door. The lightweight grate is removable and stays in place sandwiched between the curtain and the glass. The grate is made of 2′ x 4′ egg crate diffusers of the type found in fluorescent lighting fixtures. The egg crates are cut and spliced to fit the door glass. A frame of vinyl covers the perimeter. The opening cells are 1/2″ x 1/2″ and 5/8″ deep. Splicing establishes depth as well as area. The grate is polystyrene, white. Reflected sunlight striking the grate reflects again with visible light mostly continuing while infrared is mostly absorbed. 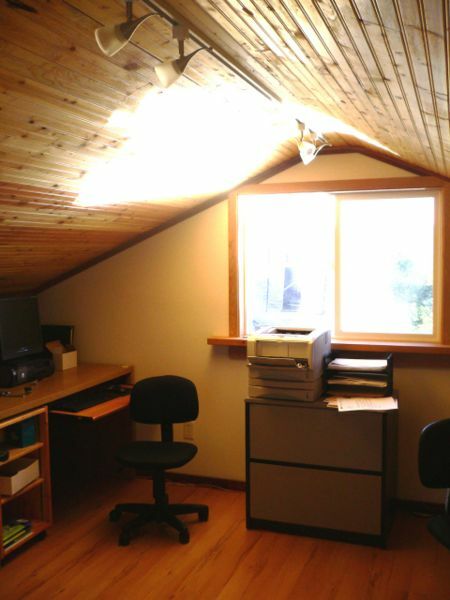 The diffusing effect creates indirect lighting instead of concentrated glare. Since using these grates (the door is in 2 parts) there have been no more ‘incidents’. The grates are easily stored and maintenance is nil. As a side note, the grates are used in summer to reduce air conditioning electricity. Grates are installed exterior to the window and have proven quite robust. The grates are “install and forget” until a/c season ends. In that application, the room is quite bright with diffused light while most of the unwanted heat is released to ambient. Electricity usage for a/c is substantially reduced. For your sliding glass doors the area is large enough to want 2 grates per door, each about 2′ x 5′. Anyway, it’s an option that might help. The grates will warm some but will stay much cooler than the darker surfaces in the video. Would you be interested in manufacturing it and take it to Shark Tank later on, who knows? I would be happy to be a partner. I have built similar things without motors.. just manual stand ..
Why not build a separate tower-like solar collector as to avoid burning the house down? Rustoleum paints appear to be awesome for absorbing solar radiation and heat transfer is decent as per a website i found elsewhere.